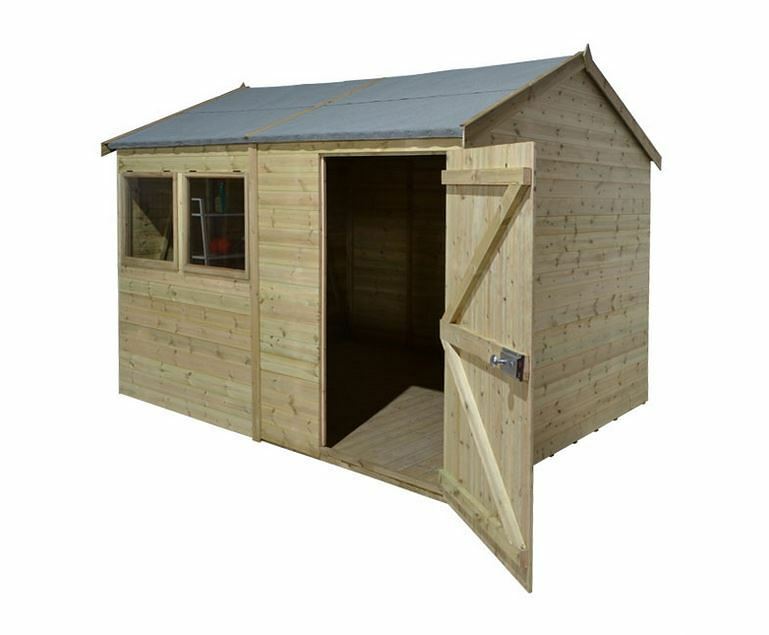 The space that the 10′ x 6′ Shed-Plus Champion Heavy Duty Reverse Apex Single Door Shed offers you is large enough that you could make this your spot for keeping items safe from the rain and well organised, or even as a workshop where you can tackle all kinds of fun DIY or arty projects. Being inside here is going to be a pleasant experience as the headroom available to you is incredible and if you are working really hard then you can open up those glorious windows and let in some fresh air. This is one very attractive looking shed thanks to the smoothed timber which has been used the shed on the outside is every bit as impressive as the inside. 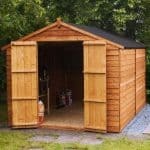 The materials which have been used for this shed are just top of the line in every regard. 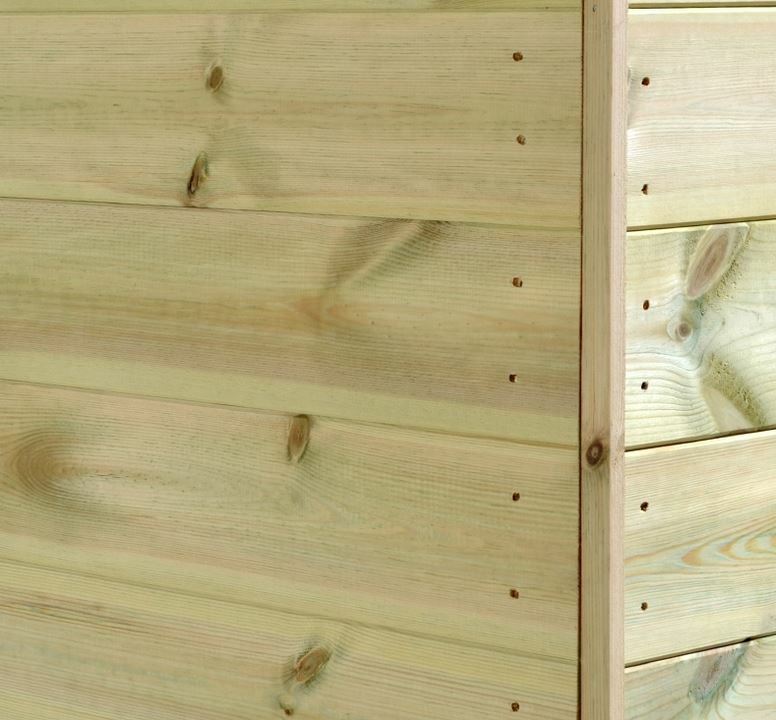 The walls are made with tongue and groove shiplap cladding and backed up with a cross braced, heavy duty frame. The flooring can take a lot of weight as it is made from tongue and groove boards and the roof is well designed in that it offers you lots of headroom as well as being strong enough to deal with a heavy snowfall and also not allow in any rain. You may want to spend more time in here than your house! We really love the look of the 10′ x 6′ Shed-Plus Champion Heavy Duty Reverse Apex Single Door Shed. The wood has been smoothed which we know may not sound like a big deal, but when you see it, you really will be impressed. The wood as well as being very pleasing to the eye, feels strong as it has all been pressure treated. Inside the shed the storage space is quite impressive and interestingly most of the space is in the width of the shed as this is a very nice, 9 feet 11 inches in its width. 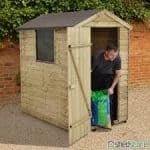 The depth is far more compact at right around 6 feet, this may not sound like a lot, but actually by putting most of the size of the shed in the width it has a very good shape to it. The height of the shed is more than high enough for most people and spending time in here is going to see you actually be able to stand upright and not hunch over. The elevated eaves that this has makes even the lowest part of the shed, 6 feet 5 inches high with the ridge height being an incredible 8 feet 4 inches. The roof has been very well designed and designed with looks and reliability in mind. You see the felt used here is no ordinary roofing felt. It is 20 kg mineral felt which is very heavy duty and able to protect the solid, 12 mm tongue and groove boards that make up the roof. We honestly could not be any more impressed with the roof that Shed-Plus have used here. The cladding really is quite impressive as we mentioned above the wood has been smooth and even in the pictures, you just want to reach your hand out and touch it. As pretty as these walls look they are just as strong as they are attractive. 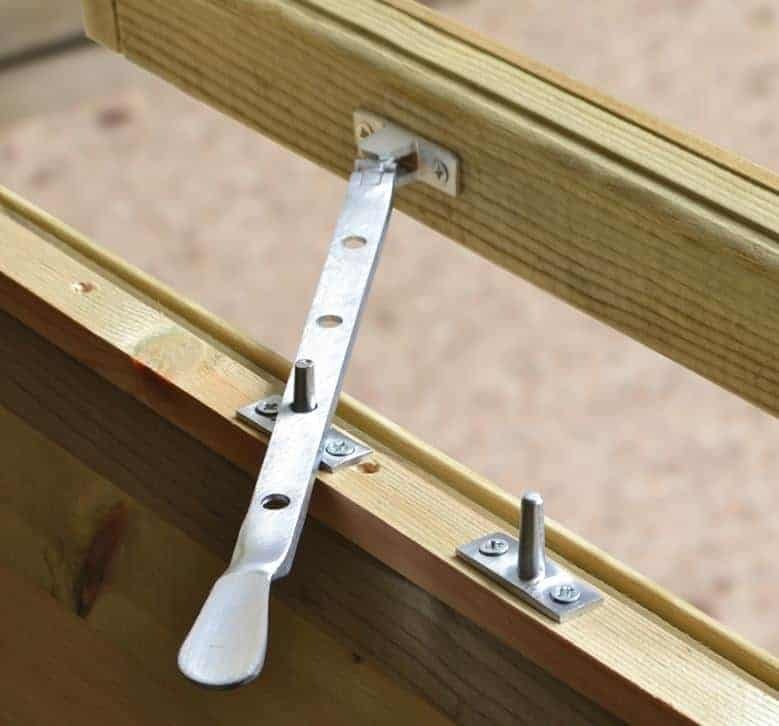 This is because for the walls, Shed-Plus have used 12 mm tongue and groove shiplap cladding. Which we are pleased to tell you fits together so snugly that there is nowhere for rain to sneak its way into the shed. One of the standout features that this line of shed is known for and something we love is the frame. At 34 mm x 35 mm and being pressure treated, the frame really is solid and will last for many years. One thing we have to mention (and something that this line of sheds does not get enough credit for) is that the frame is made even strong by the end panels having cross braces. As you would expect going by the stats of the rest of the shed, the floor is also very well made. Shed-Plus have once again used 12 mm tongue and groove boards like they did with the roof for the floor. Floorboards are where some sheds will try and cut costs by using cheaper boards, these ones though are far from cheap. They are incredibly solid and to make the floor feel fantastic under your feet, pressure treated floor joists have been used to not only make walking around inside feel great, but also so that you can store many heavy items in here. With the wood being pressure treated it is coming to you very well protected. Still though, we always recommend coating it in wood treatment to give the wood the ultimate protection. You really only have to do this once a year and the shed will last for a long time. The 10′ x 6′ Shed-Plus Champion Heavy Duty Reverse Apex Single Door Shed has a 15 year anti rot guarantee that covers you against any decay in the wood. Shed-Plus have really outdone themselves with the incredible door that they have put on here. It stands at 5 feet 11 inches high and is a respectable 2 feet 11 inches. This is plenty of room to get larger items into the shed. Shed-Plus have given the door some extra framing and have also made it ledged and braced. In addition to this it is held in its place with some very strong hinges. 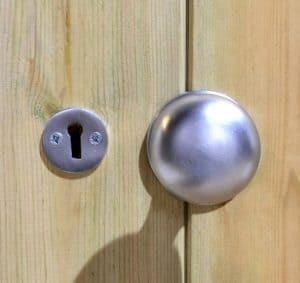 One the front of the door we have a proper handle and a lock as well, we always like when a shed uses a proper handle instead of some kind of latch. On the front of the shed we have two very nicely sized windows. These are made with toughened glass which is something that is great in general, but it is especially good if you have kids. These windows will allow a lot of light into the shed, but as they open. If things get a bit stuffy inside there then you can open them up and let in some fresh air. We mentioned the lock just before, but it really does make this one very secure structure. Being able to keep things locked up while you are at work or during the evenings really does give you peace of mind and makes you more willing to store things that are expensive inside here as you know they will be well protected. Privacy is not something you really get with this shed due to those fantastic windows. It is easy to look inside, but we do know that is something that may be an issue for some people. In this case we think that a classy set of curtains or even some blinds would give you the privacy you need and not hurt the look of the shed. 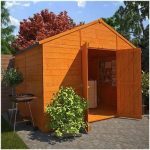 We mentioned before about giving the shed a coating of wood treatment and this is actually a fun way you can change the look of the shed a little bit and also protect the wood in the process. There are a few extras available with this shed. 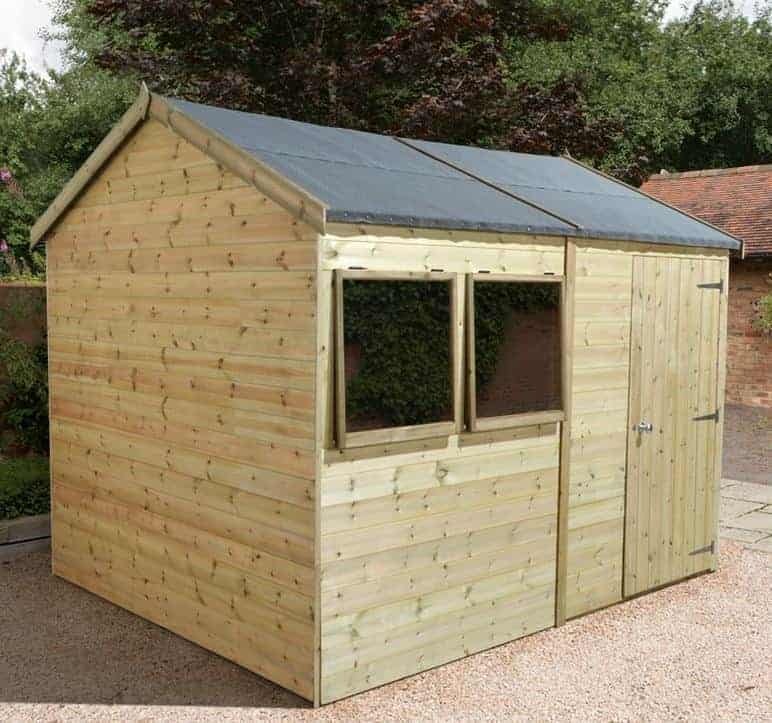 To start with we have the Shed-Plus slatted roof which we will admit really does look awesome, but at £249.99 it is a very expensive extra that really is not necessary, still it does look great. If you plan on using this as a workshop then you may be interested in their workbench which costs, £79.99. The last thing they offer is an installation service where they will take care of building the shed for you. This will cost you an extra, £109.00. The Champion series of sheds is all about being high quality, but it still impresses us immensely when we see a new shed in this line as the quality is just so high. 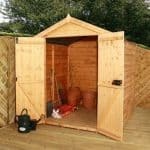 With the wood being pressure treated and also with you treating it once a year, you will find that this is a shed which is going to be with you for well over 20 years. We love the room that this shed offers. It is not just the room on the floor either, but the vast amount of headroom you get as well. Any shed of this size is going to take a bit of effort to build and you will need the help of a friend. We think even a couple of novices when it comes to DIY should take no more than four hours. 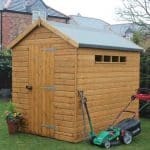 This is not what we would class as a cheap shed, but the quality and the size it offers makes this very good value for money in our opinion. Final Thoughts: The 10' x 6' Shed-Plus Champion Heavy Duty Reverse Apex Single Door Shed is a structure that really did leave quite the impression with us. To start with the look is just incredible, with the smoothed timber and the overall design being something we really like. But as well as being attractive this shed is very strong thanks to the pressure treatment process it goes through and the extra effort made to give the frame a bit more strength. Storage wise we feel 10 x 6 is more than enough room for most people and the size is large enough in both its floor space and headroom that using this as a workshop would work out very well. 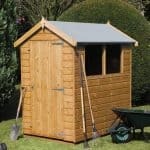 In all this is a shed that we highly recommend, even though the price is a little high, we do feel that it is worth it.